FRIENDS, FAMILY, COMMUNITY AND SUPPORTERS! AS OF 2:30 AM FRIDAY FEB 5, WE ARE EXCITED TO ANNOUNCE THAT THE COCKTAIL PARTY IS SOLD OUT. WE CAN'T FIT ANY MORE PEOPLE. BUT WE HAVE NOT REACH OUR GOAL YET. WE'D LOVE TO SEE YOU AT THE EVENT ON SUNDAY. IF YOU'RE SO INCLINED, PLEASE USE THE BOTTONS BELOW TO MAKE A DONATION. I recently found out that I have to have major surgery, as you might imagine, it has thrown me for a loop. As a self-employed community event producer (Truth Serum Productions) and full time performance artist I will not have any income during my surgery and recovery afterwards. I am unprepared for the financial strain that 4-6+ weeks of downtime will create. The immediate need for this surgery is a surprise and like many artists I don't have a financial buffer, so I'm taking the difficult step of asking my friends and communities to come together and help me get though this surgery and recovery process. 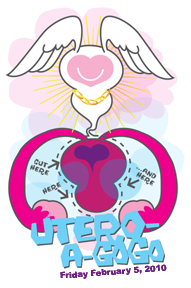 I am so grateful to my friends who are hosting a private benefit cocktail party for me called Utero-A-GoGo No. 1. The party will be held Friday February 5, 2010 in a SOWA loft, recently featured in The New York Times. There will be celebrity bartenders ( Josey Packard from Drink and just featured on Rachel Maddow and ladies from from Lupec mixing custom cocktails with appropriately inappropriate names! There will be delicious food! And live entertainment (Kelsey Jarboe and Adrienne Marie Naylor aka Dykonoclast)! On February 10th I'll turn 41. So it's kind of a birthday party too. Let the decline begin! Use the handy buttons below. Or donate $41 or more per guest via PayPal to uteroagogo(at)gmail.com. if you don't use PayPal, you can use a credit card via their site. Please include a note where it says, "Add special instructions to the seller" including your name and how many people in your party. Or if PayPal and credit cards aren't your prefered method, RSVP via email to uteroagogo(at)gmail.com and we'll make arrangements for your donation at the event.